Ringmen reflect on their most memorable Expo experiences. What are yours? If you are a cow person and you’ve attended World Dairy Expo, I would wager you have a favorite showring memory. These three individuals who are up close and personal with the cows during the breed shows recently shared their most memorable experiences with us. Although they go unnoticed by most, these seasoned professionals work as ring attendants and play a major role in running the show efficiently. Ron Mosser is a senior appraiser with the American Jersey Cattle Association (AJCA) and an area representative for the Jersey Marketing Service. He has been a Jersey ringman for 10 years. Jon Powers raises Holstein heifers on his registered Holstein farm, Powers Haven Holsteins, in Columbus, Wis. He has served as an Ayrshire ringman for 15 years. Bob Hagenow is a sales manager for Vita Plus Corporation in Madison, Wis. 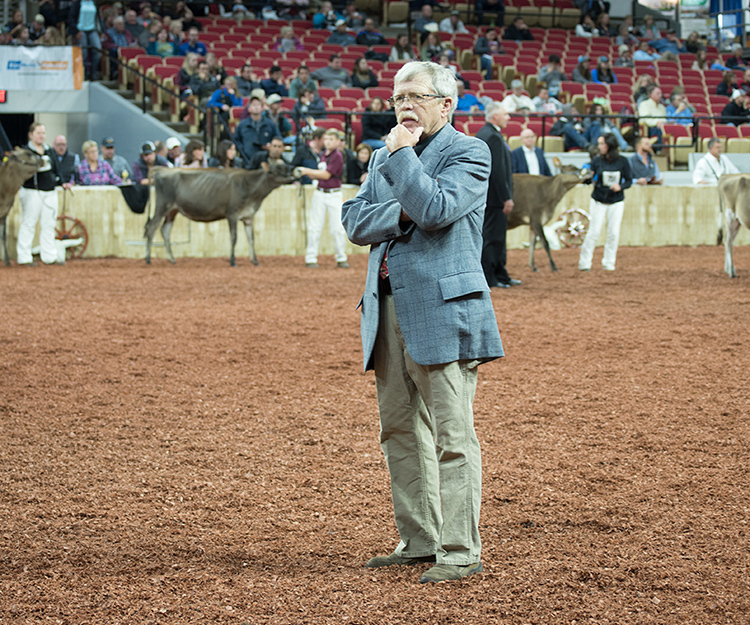 He also serves on the World Dairy Expo Board of Directors and the Executive Committee. He is currently a ringman for the Holstein and Brown Swiss shows and has held those positions for the past 30 years. What is your most memorable experience as a ringman? Mosser: There have been a lot of highs and lows over the years, but there is one high in particular that comes to mind for me. My first year exhibiting at the Royal Winter Fair, Bill Flecher and his girls were tied next to me. Now, his daughter, Julie, and her girls are involved in the business. Last year, when Pleasant Nook won Premier Breeder at Expo, Julie turned and gave me a hug. Powers: I always enjoy watching the championship parade each year. Hagenow: For me, it is all the interesting people that I’ve met along the way. From a cow perspective, it was neat to see Rainyridge Tony Beauty be named Grand Champion of the Holstein Show at 14 years of age and for Snickerdoodle to win Grand Champion of the Brown Swiss Show so many times. The author is an associate editor. She covers feeding and nutrition, youth activities, and heads up the World Dairy Expo Supplement. Maggie was raised on a 150-cow dairy near Valley Center, Kansas, and graduated from Kansas State University with degrees in agricultural communications and animal sciences.